I had worked on the local papers since 1979, officially employed at the age of 16 as junior photographer on the Spalding Guardian, though I had worked there for a year before in the summer holidays and at weekends, getting around on my bicycle with a Rollieflex, before going back to the studio to shoot flat copies on a Speedgraphic. God it makes me sound old. The weekly newspaper was a great place to learn but I yearned for bigger and better things, so when I was 25 (I think?) I landed a job with the Northamptonshire Evening Telegraph in Kettering. Not exactly the big city but it suited me at the time. The local papers were a fantastic place to learn about photography news but more than anything it taught me about people. I made every kind of mistake you can make in a job without getting fired, god knows how I didn't. A great experience that I would not trade for anything. Just don't ask me to go back. The excitement of working in a town of 60,000 at the Northants ET began to wane after a while and I decided I wanted more. 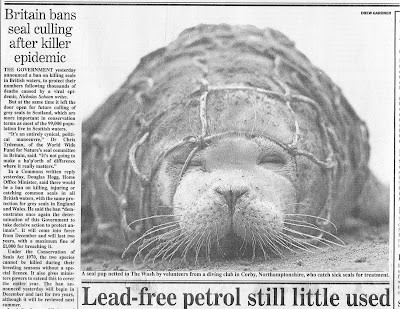 Here is one I have managed to dig out from 1988, where I went out with the British divers who were rescuing seal afflicted by a canine virus. But my moment of 'glory' came when I went to the Isle of Harris where my friend Steve McComb was working as a postman and I photographed him walking to deliver the post to the last village in the UK without a road during the Mail strike, I suppose you could call him a strike breaker but the only picket line was some black face sheep which didn't seem too bothered about pay, conditions or pensions. I now had the taste for travel, (to Scotland), and I was starting to live the dream. Nothing was going to stop me now. So I waited until they had appointed a Picture Editor, in the shape of respected former Sunday Times picture editor Michael Cranmer. I then subjected him to a bombardment of letters and phone calls until he gave me an interview. Remarkably my sheer enthusiasm won him over and I was shortlisted for one of the contracts on the paper. But like a minor team's magical FA cup run, the dream had to end and so it was that sanity prevailed and he gave the job to a much more established and respected name. It was a blow but the last thing to do was to face up to defeat and reality. So I decided I needed to photograph a war. Whilst having a day job on the local newspaper. I had a fascination with Cambodia ever since reading John Pilger's account of the killing fields, and how the world stood by. The Khmer Rouge had been ousted by the Vietnamese, leaving a rather interesting situation of the bad guys (in the West's eyes at least) putting an end to mass genocide whilst they stood idly by. I wanted to experience something amazing and tell the world about it. So, I booked a three week holiday. Got on a 23 hour Aeroflot flight to Bangkok, where in the process my fear of flying was replaced by an aversion of truly awful airline food. 'Erm Great......(Very long embarrassed pause) we will let you know if anything comes up'. It was then I faced the true gravity of the situation. I had sold my car to finance the trip, I was totally out of my depth, I had no plan, I was alone a long, long way from home and at this rate the money would run out in a few days. Find out in Part 2. My beginnings go back to an old Yashica TLR on a skateboard ;-) Oh how I love the images from that old camera and I should have kept it. I used to get home and develop the film, put them into the enlarger carrier, then ask myself why the hell I was screwing with 35mm LOL. I guess it in part relates to the comment I just left on your Phase post. I can't wait for part two of your story. My photographic life took a turn. 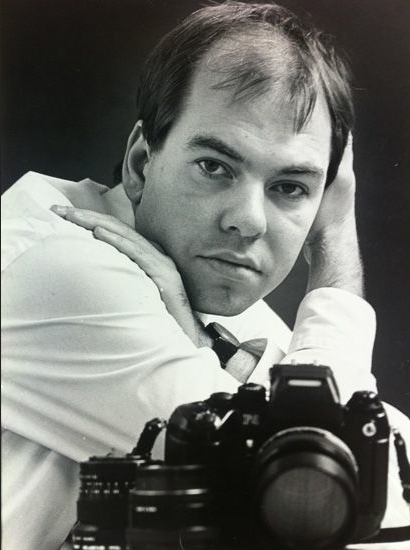 I fell into a high paying non photographic job at a young age and didn't follow the dream. I never put down the cameras during that time, but I sometimes wonder how things might have been different. thanks for a very interesting read. It is all true too!